The movie The Blind Side came on TV the other day. Being both a huge sports fan and Sandra Bullock fan, I was naturally pretty damn excited. And I was thoroughly enjoying the movie for a solid 60 minutes or so. If you’ve seen this generally delightful sports comedy highlighting the tale of a homeless teen taken in by a well-to-do family, you know where I’m going with this. In walks Mr. We-can-make-a-57-yard-field-goal-but-not-a-33-yard-one. He somehow managed to kill the movie in all of about 3 seconds. Maybe the memories of the Iron Bowl are still too fresh. 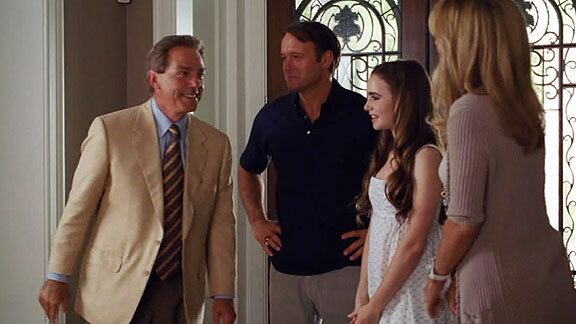 Nick Saban is ruining everything I love. STOP LOOKING AT SANDY LIKE THAT! The Blind Side is currently sitting at 66% on Rotten Tomatoes. If Saban’s bad-acting, hillbilly face had hit the cutting room floor, I think that number is close to 80%.